If you use Azure Storage to keep your SQLServer backups then you are probably already aware of “Microsoft SQL Server Backup to Microsoft Azure Tool” that allows you to send your backups there. In this post, we will show how it works and why SqlBak does the same thing in a more convenient way. But you still have to create the database backups by yourself. This utility is responsible just for sending backups to Azure. There is a lack of automatic backup scheduling, reporting, error notifications and many other features found in SqlBak. SqlBak is SAAS that allows you to create and restore SQL Server backups right from your browser. First, install a SqlBak app on your SQL Server and connect it to your account on SqlBak.com. Then you will be able to create backup jobs and make all necessary configuration from any place where you have Internet access. It takes just a couple of minutes to create SqlBak backup job. You can learn how to do it in this article or by watching this video. During the backup job setup, you can choose multiple places where your backups will be stored, it can be local or network folder, FTP, Dropbox, Google Drive, OneDrive, Amazon S3 or Azure Storage. Optionally, you can enable additional features like compression, encryption, folder backup, email notifications, custom scripts, and more. But one of the most useful features of SqlBak is backup scheduling that allows creating backups automatically according to your schedule. Moreover, you can restore any or created backups right from SqlBak’s web interface. It will be automatically downloaded from Azure and restored on your server. 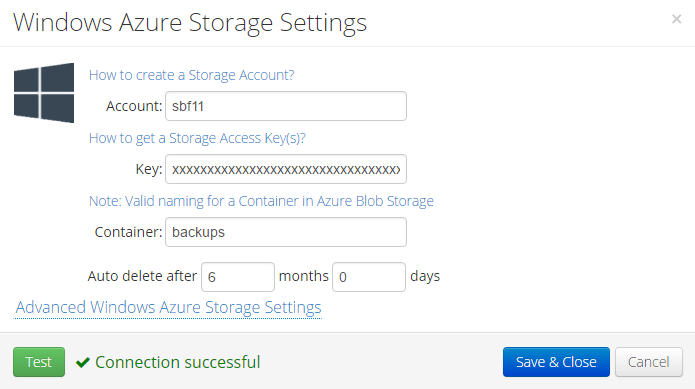 Both applications allow you to send your SQL Server database backups to Windows Azure Storage. But as a simple utility, Microsoft SQL Server Backup to Microsoft Azure Tool only sends your files to Azure leaving the job of backup creation to you. 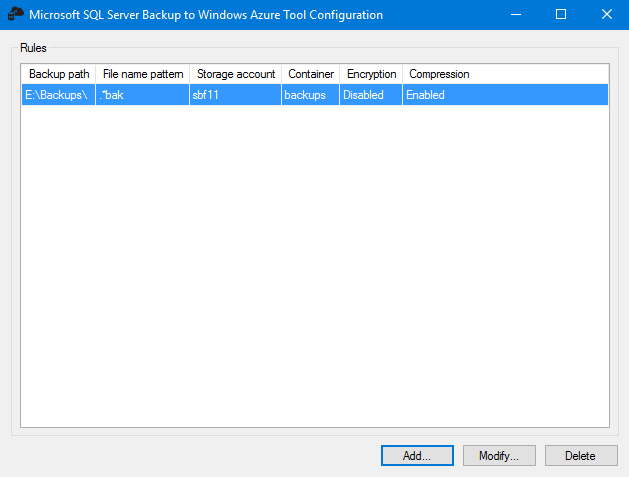 SqlBak being a full-featured database backup service will do everything for you: backup your database automatically, send the backups to Azure, notify you if something goes wrong and even restore backups back to your server upon request.